Drobo FS provides redundant data protection without the complexities of RAID. Just plug in your Drobo FS, and your data protection is all set up with no configuration required. We call this BeyondRAID™ technology. You’ll call it peace of mind. Drobo FS connects directly to a Gigabit Ethernet network to make sharing your data easy. Just plug it into any switch or wireless router and you are ready to go. Connect to your Drobo FS using any Windows, Mac, or UNIX/Linux computer.¹ Whatever system you have, it's likely you'll be able to connect to it over your network quickly and easily. Drobo FS holds up to five drives allowing you to effortlessly grow your storage to meet your data capacity needs. To add more space, simply insert a new hard drive or replace your smallest drive with a larger one, even when all drive bays are full. And unlike traditional RAID systems, the BeyondRAID technology in Drobo FS enables you to mix and match drive capacities, brands and speeds. This unprecedented flexibility allows for continuous expansion as available hard drive capacities increase. 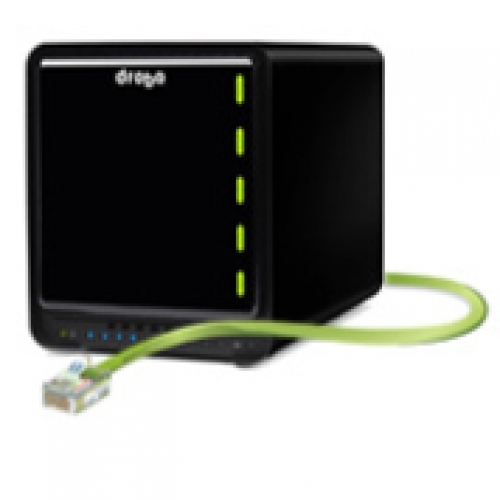 With Drobo FS, expansion is automatic, instantaneous and access to data is always maintained. Enable the dual-drive redundancy option to protect your data from failure of up to two hard drives. It’s all done with a single-click and you never lose access to your data. Running out of space? No problem. Switch back to single-drive redundancy at any time. Unlike moving between traditional RAID levels, there’s no need to reformat or migrate data off of the Drobo FS — potentially saving you hours or days of downtime. With the self-healing technology incorporated into Drobo FS, your data is safer than ever. When sitting idle, Drobo FS will proactively examine the blocks and sectors on every drive, flagging questionable areas. This preemptive " scrubbing" helps ensure your data is being written only to the healthy areas of your drives. When a drive fails, Drobo FS keeps your data in the safest state possible by moving your data to the available space on the remaining healthy drives. Select from a wide selection of free DroboApps designed to give you the freedom to configure and customize your Drobo FS to meet your own unique set of requirements. Our growing library of DroboApps² adds amazing functionality like media, web, and more!